Trend Trading is an indicator designed to profit as much as possible from trends taking place in the market, by timing pullbacks and breakouts. It finds trading opportunities by analyzing what the price is doing during established trends. Established trends offer dozens of trading opportunities, but most trend indicators neglect them completely! 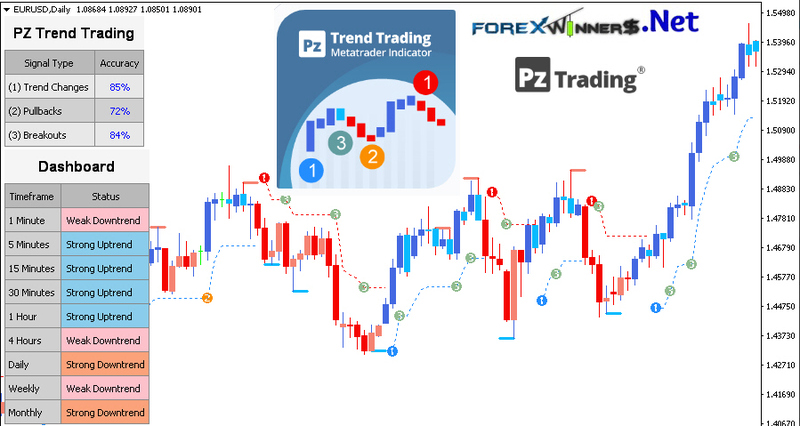 The Trend Trading indicator displays an average of 10 different trades per trend. Boost your trading returns with the most complete trend trading indicator available, just like hundreds of customers have already done. Established trends offer dozens of trading opportunities, but most trend trading indicators neglect them completely, and leave the trader completely uninformed about what the market is doing during a trend! The average trend indicator only informs about trend changes, but that is simply not enough to achieve exceptional returns. The Trend Trading indicator displays up to 20 times more trades than the average trending indicator, because it pays attention to what is known as market timing. It displays, not only the current market trend, but also pullbacks, breakouts of inside bars and corrections. It allows you to hop on a trend just after a retracement has taken place, pyramiding positions safely using breakouts of inside bars and also to find potential reversals, known as corrections. The indicator works only if your Meta Trader is connected. It will not work if you are offline. Don’t forget to allow Dll. Open the indicator two times on the chart to give you the full information boxes for trading. Thanks for Mr James from Spain who sent us this indicator.